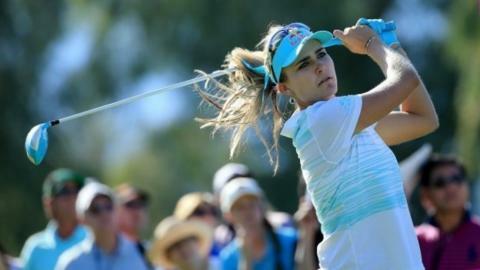 Lexi Thompson says Augusta should stage a women's version of the Masters. The 19-year-old American, who last week clinched her maiden major at the Kraft Nabisco Championship, believes a women's event at the Augusta National would be a huge boost for the game. "That would be unbelievable," she told the BBC World Service. "You never know, that could happen easily in the future. It would be interesting to watch and play on that golf course. I mean, it's beautiful." The Augusta National is a private club which only admitted its first female members in 2012 when former US secretary of state Condoleeza Rice and US financier Darla Moore took up invitations to join. Meanwhile, Augusta's chairman Billy Payne, in his pre-Masters news conference, said he backed a move by the male-only Royal and Ancient Golf Club of St Andrews to ballot its members on opening up to women. Payne is also a member of the R&A, an offshoot of the Royal and Ancient that governs the rules of golf outside the US and Mexico. The R&A also organises the Open and has come under fire in recent years for staging the year's oldest major at clubs such as Muirfield, Royal St George's and Royal Troon that retain male-only membership policies. "I bet you can guess how I'm going to vote," said Payne of the 18 September ballot. "We readily and joyously welcomed our lady members when that happened a couple of years ago and it remains a very good decision on our part. We are so delighted - and I know I speak for everyone - that they are members." Thompson became the youngest player to compete in the US Women's Open when she teed up in 2007 as a 12-year-old. In September 2011, she set a new record as the youngest-ever winner of an LPGA tournament - at age 16 years, seven months, eight days - when she won the Navistar LPGA Classic.